milk dreams: gDiapers are gEnius! The last time I wrote about diapers here, we had settled on Seventh Generation. I still hold to the fact that they are the best choice out there if you need to use disposables. However, we had chosen disposables before because a) we couldn't get cloth delivery service (for a variety of reasons--read about it here), and b) we didn't have good options for laundry (laundromat not conducive to washing out poopy diapers). We moved in the beginning of December to a bigger place. While we still don't have the luxury of diaper service nor a washer/dryer in our apartment (so rare for NYC), we do have laundry access in the building now. With this upgrade, we decided to try out a new diaper regime. We still didn't feel totally ready to go fully cloth, considering we both work full-time outside the home and it's still somewhat of an "outing" to do laundry here. 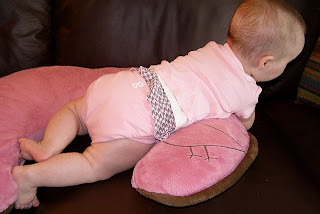 However, we learned more about gDiapers--those clever little hybrid cloth-disposables-- and agreed to give them a whirl. I stated previously that we didn't try gDiapers because we'd heard horror stories of the disposable inserts not flushing like they say they will. We still don't flush them. We actually tried to flush one at my parents' home over the holidays, but--alas!--it clogged the bowl (sorry you're learning this by reading it, Mom and Dad--we didn't tell you at the time because you had enough to worry about and knew you'd stress out) and took a day to break down fully before it would go all the way down. What we learned, though, is that the disposable inserts can also be composted (another thing that doesn't help us in the City, but a nice thought!) or thrown away more responsibly than other disposable diapers. The inserts are pastic-free, 100 percent biodegradable, and certified "Cradle to Cradle" (meaning that all of the elements break down and return to nature in a benign or even helpful way). When we first tried gDiapers, I bought a starter kit, which was a nice non-commital way to break in and see if we liked them. Unfortunately, I don't see them on the gDiapers website right now and only available in large size on Amazon, so they must have discontinued this option. At first I was a bit puzzled with how to shove the seemingly-gigantic disposable insert into the plastic liner, but, once we got the hang of it, it became second nature. During our first trial week of gDiaper use, I yanked out one of the snap pieces from the diaper itself. It seemed like I had just gotten a lemon diaper, so I e-mailed the company and heard a response within a day from someone who apologized for the inconvenience and asked for my mailing address so she could send me a new diaper cover immediately (which she did and I received promptly). Since then, we now have 8 diaper covers that we use constantly and have never had another problem. The other big issue with gDiapers is cost. I'm not going to lie: they are pricey. The giant bags of diaper waste we were throwing out each week when we were using plain-old disposables, though, made me ill to think about the damage we were doing to the environment. While gDiapers aren't fully cloth (actually, they do sell cloth inserts that are washable, too, but that's a whole other thing), our waste has shrunk and is a lesser evil for the environment. I believe that if we want to make change to ensure our children actually inherit an earth that is still inhabitable, we need to invest resources (in this case money) in this future. I have no problem paying a little more for something that is paving the way for greener pastures for sweet Ruby. This being said, there is a limit to my generosity of spirit. The little corner supermarket closest to our apartment has the standard bags of gDiaper disposable inserts for $29.99 each (32 per bag for the medium/large size that Ruby is in now)! This is shockingly high: almost 94 cents per dirty diaper (let alone the initial costs of the cloth outer pants and plastic liner)! I simply cannot afford that kind of nonsense. I like to support local businesses, but that markup is out of control. One bag retails on gDiapers.com for $14.49. I buy mine on Amazon , because they have packages of 4 bags (128 diapers total) for $52.00. This is actually the same price as they are on gDiapers.com, but Amazon gets me with that free shipping. Plus, you can do the Subscribe-and-Save option on Amazon and save another 15 percent, making them $44.20 for four bags (compared to $119.96 if you bought them from my local grocer!). I like the Subcribe-and-Save option because you save money, plus I can easily turn it off after I make the purchase and then turn it back on again when I want another batch (diaper use changes from week to week, so it's not easy to just say you want them every X number of week). Although they're not perfect, I love gDiapers for their ingenuity and their ability to bridge the gap between cloth and disposables for people like me who want to do what is best but don't have the logistical capabilities of the full cloth experience!